Tapestry House is a family owned business, created & started by Bobbie and Mark Randolph in January of 2004. Bobbie & Mark and their two daughters, moved to LaPorte late in 2003 with the dream of creating Tapestry House. 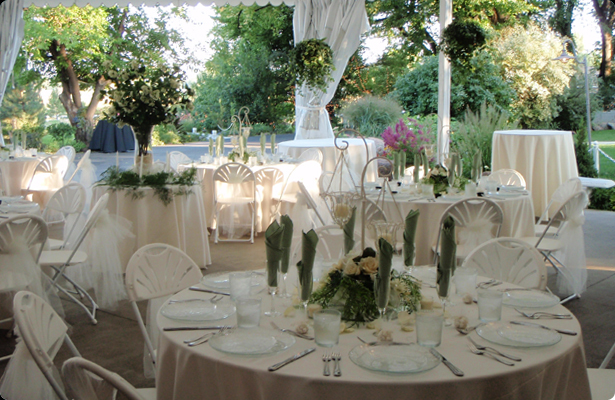 They developed the property and grounds into an ideal wedding venue. In the first ten years at the Tapestry House the have hosted over a thousand weddings – each special and unique in its own way. In 2015, Bobbie and Mark formed a partnership with Wedgewood Wedding & Banquet Centers to bring a wider array of services to Tapestry House brides and grooms. With 30 locations across the southwest and 30 years of experience in the business, Wedgewood offers a professionalism and expertise to couples that is unmatched by any other in the industry. Wedgewood is also a family business. The company was founded in 1986 by John and Linda Zaruka, and their children – President Bill Zaruka and Managing Partner Stacy Zaruka – are active in the business today. The Randolph families share a passion for creating unforgettable events and first class customer service. Tapestry House sits on the site of the old Hawkeye Ranch, which was one of Larimer County's early working ranches. In 1870, Iowa ranchers John & Frances Riddle moved their 11 children and livestock to Colorado. They fell in love with the Cache la Poudre Valley and settled along Shields Street in Fort Collins. In 1875, their son Eli Asbury purchased land just north of LaPorte and named it Hawkeye Ranch in honor of his family's Iowa roots! Eli built the barn in 1880 and a Victorian House in 1890. Eli was a horse trainer and seller and used the barn for those purposes. Eli sold the property to George Yost in 1909. Owners since have included: George Yost from 1909 to 1914. Tom Beach from 1914 to 1918. Joe H. Ward from 1941 to 1945. In 1945, cattleman Stanley Webber purchased the property. He operated the ranch using the SW Bar brand and sold the property to George and Mary Burgess in 1957. In 1959 the Burgess Stock Farm, as it was then known, was put on the market for $135,000. They sold it to Amos & Howard Mosher in 1961. The property at that time included 395 acres of land including corrals, silos, stockyards, water rights to the Jackson Ditch and the barn and house. The Jackson Ditch was the first irrigation ditch in LaPorte built by hand and horse. It's water rights were one of the first appropriations from the Poudre dating back to 1861. In 1974, the Rev. Bill and Mollye Morrow purchased the property from Doris Bosky. Mrs. Bosky had sold off all but the five acres of land after her husband died. In 1984, the Morrows gave the house to their son, David (a home designer and builder) and his new bride, Julie. Due to its deteriorated condition, David and Julie with help from their four sons and a neighbor, Bob Freytag, began dismantling the old house in 1997. They carefully salvaged wood, brick, stone, and architectural elements, incorporating them back into the new Queen Anne Revival Victorian that occupies the original house site. They even rebuilt the old stone cooling cellar, reattaching it to the new house. David designed and built the new house over four years, finishing it in 2002. In his quest for authenticity, David used quarter-sawn white oak to create old-style woodwork, including the raised panel wainscot, hardwood floors and the elegant stairway to the second floor. He milled every piece of wood used to build the doors, moldings, railings, posts and gingerbreads in his shop which was in the old pole barn / six car garage at the back of the property. This building was renovated into the current Reception Pavilion facility in 2005. David spent four months chipping the stone at the base of the house to be sure that it was authentic to the style of house. The covered front porch was patterned after that of Teddy Roosevelt’s New York home. In keeping with the Queen Anne Revival style, the house exhibits a steeply pitched irregular gabled roof, patterned shingles, asymmetrical facades, turrets, arches, elaborate spindle detailing, and a broad porch. 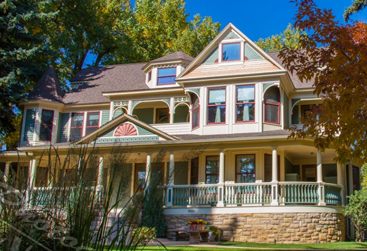 The Queen Anne style was built throughout the country from the late 1870’s to the early 1900’s. The home is also called a “Painted Lady”. In the Victorian era, “painted ladies” were homes that sparkled with color, featuring three or more contrasting colors of paint. The exterior of the Tapestry House has six colors of paint, including a rich green complemented with brick-red, salmon and cream in the gingerbread trim. 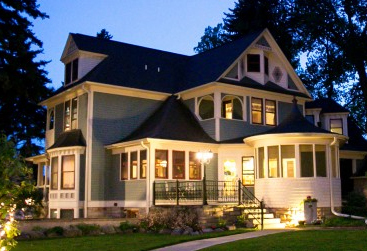 Although the home is new it is such a remarkable reproduction of a Queen Anne Revival style Victorian home that the Poudre Landmarks Foundation has included it twice, since 2002, on its historic homes tour. In December 2003, Bobbie & Mark Randolph purchased the property from the Morrows after the County approved turning the property into an event venue called Tapestry House. Bobbie & Mark wanted to preserve as much of the historical value as possible keeping the Hawkeye Ranch name on the barn and keeping the historic flavor of the barn by using it for offices and storage. The barn is built of stone that was quarried from the bottom of what is now Horsetooth Reservoir. Because of the property's long history it is graced with over 40 majestic and century-old trees, profuse lilac and honeysuckle bushes, and is home to numerous songbirds, hummingbirds and butterflies. In November of 1836 a group of fur trappers and traders made camp near a river in the Poudre Valley. Overnight a snowstorm blew through the valley and in the morning their wagon train was stuck. The leader of the party, Antoine Janis, gave orders to dig a pit and store the supplies they could not carry through the snow. They stashed supplies including gunpowder. The French speaking trappers called this spot Cache la Poudre, "the hiding place of the powder." The river took on that name. Months later, they returned to the valley and retrieved their supplies. The valley went back to sleep for almost another decade with no permanent white settlements. In 1844, the son of Janis, Antoine Jr., returned to the valley he had seen with his father eight years before. He staked a claim and built a home in the valley making him the first white settler in the Poudre Valley. In 1848, a band of Cherokee Indians traveled from the South Platte River, near present day Denver, along the front range to Wyoming where they joined the Oregon Trail heading west. The route they used would be called the Cherokee Trail for many years. Today it is better known as Highway 287 and the Overland Trail! The winter of 1849 brought Kit Carson and his company of trappers to the headwaters of the Cache la Poudre where they set up camp. During the 1850’s floods of immigrants rushed past Colorado on their way to the West Coast gold rush. The only settlement in the Poudre Valley was a small number of trappers and traders that came and went from the place they called LaPorte, a French word that means “the Gateway”. At that time there were no more than a hundred white men in the valley. Their neighbors were the Arapaho and Cheyenne Indian tribes with whom they shared the valley in peace. All of that changed when a small amount of gold was found near Denver in 1858. Within a few months thousands of people poured into Colorado seeking their fortune. The pioneers that came to LaPorte in those early years built between fifty and sixty log homes and businesses along the banks of the Cache la Poudre River. LaPorte became the most important center of commerce north of Denver. At that time town lots commanded a higher price than those in Denver. In November 1861 the territorial legislature designated Laporte as the county seat. In 1862 the Overland Stage began operations from Denver to Fort Laramie and LaPorte was a main home station establishing a regular transportation route for passengers, mail and freight. LaPorte became a bustling business and supply center for emigrants and included four saloons, a brewery, a butcher shop, two blacksmith shops, a general store and a hotel! Because the stage was the main transport of people and goods it became the prime target for attacks by Indians and outlaws. That same year Camp Collins was established by the U.S. Army along the Cache la Poudre River to protect the stage line from attack. The army post was destroyed in a flood in 1864. It was relocated downstream to a location in present-day Fort Collins. In 1881 a state election was held to determine the location of the state capital. Denver won over LaPorte by one vote! Colorado history abounds with stories of Slade. Legends never die and local tradition tells of Slade robbing stages, rustling cattle, and stealing horses long after he had left the area and even after he was hanged by vigilantes in Virginia City, Montana, in 1864. There is even a local LaPorte legend that “Shotgun” Slade hid out in the Tapestry House barn!